An away win, in the Champions League, with a clean sheet. Mustn’t grumble, as they say. More importantly, the belief is oozing through the squad. It was a good away performance in the Champions League, particularly after the nerves of Wembley had spoiled the opening group game against Monaco. With back-to-back games against Bayer Leverkusen, winning the home game followed by as solid a performance as this, will stand us in good stead for reaching the knockout phase. We won’t win the trophy but a good run could be the making of this squad. When you think of the players who were missing – Rose, Dier, Dembele, Sissoko and of course, Kane – to win here and relatively comfortably as well, it is a testament to the depth that Poch has added to the squad since arriving. 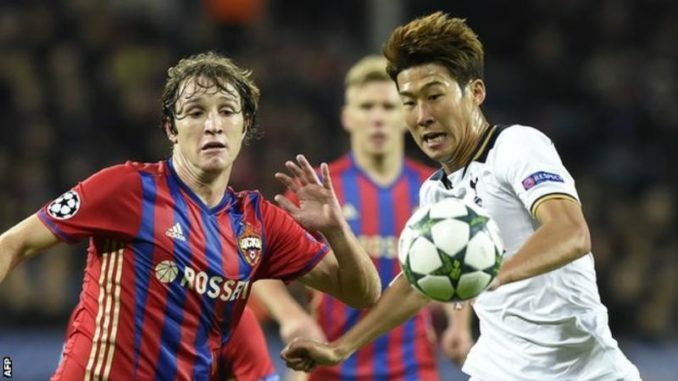 It was another Son Heung-min goal to add to the collection but we might have had more. Dele Alli rattled the Moscow crossbar from outside the area – the type of strike we all want to see more of from him – as well as going close with a header. Son’s goal came at the right moment. You could see that the frustration was surfacing in the players, a sense of deja vu with missed chances costing us dear in the past. This time, for all of the ball that we had, we weren’t particularly a threat for the opening hour. Nor were CSKA either. As the home side, you expect them to have chances but they were few and far between. If they can get a draw in Germany, we ought to have more than enough ability to win there, as well as the home fixture as well. After the match, Poch observed that we played a lot better than at home and it’s hard to dispute that. However, it’s also important to note that we weren’t at Wembley and the pressure was off. Perhaps we’d enjoy more success there if we approached it as if it were an away game. The problem is that we would moan like hell if the players backed off and sat back. The endeavour of the first half turned to menace when Janssen was replaced by N’Koudou. The injection of pace stretched the Muscovite defence and we profited from the extra space which appeared. It was a shame Janssen’s effort was disallowed in the first half, not just from a winning perspective. A goal from open play in a high-profile game would do him the world of good in settling in. He strikes me as a player who will score regularly but just needs to get a goal other than from the spot. And for all the praise for the strikers, the solid defensive work of Vertonghen and Alderweireld can’t go unrecognised. The pairing has been strong for us this season, working hard to minimise opposition threats and last night was no exception. If they were to be absent, that would probably be more of a concern that Kane’s injury to be honest. But that’s too worry unnecessarily. The Champions League campaign is up and running, feeding confidence ahead of this weekend’s big clash.